With the Frieze Week in London around the corner, here are some highlights for the two major fairs selected by Christie's team of experts. Born in Brussels and now working in New York, Harold Ancart is reconfiguring the art of drawing, using chance and repetition to create installations that incorporate found objects, minimal traces and graphic underlining, and are made in ink, charcoal powder and soot. The 25-year-old artist is represented by New York's Clearing gallery which is included in Frieze's Focus section dedicated to young galleries and rising talent. This year Frieze Film sees the premiere of a new dance-based work by the legendary Charles Atlas, the director who collaborated with Merce Cunningham in creating dance for camera. This time Atlas has worked with the experimental New York-based choreographers Silas Riener and Rashaun Mitchell on a short video that will accompany a long stereoscopic project. Picked by Art Review as a future great, the American artist Rachel Rose has won this year's Frieze Artist Award, which gives an emerging artist the chance of a major commission as part of Frieze Projects. Although best known as a video artist, the 29-year-old has chosen to create an installation in the form of a scale model of the fair, which will include an impression of the animals in Regent Park. The Spotlight section at Frieze Masters is a forum for scholarly presentations of 20th century artists. One focus this year is African American creators, and two galleries new to Frieze have important solo shows. London's Stephen Friedman Gallery looks at the pioneering early work of Melvin Edwards, who was born in Houston in 1937, and places a dramatic, large-scale sculptural installation made from barbed wire at the centre of its show. Meanwhile, Alexander Gray Associates from New York is focusing on Jack Whitten's time as a researcher at the Xerox Corporation in 1974, an experience that led to a remarkable series created by applying toner to rice paper and manipulating the results. 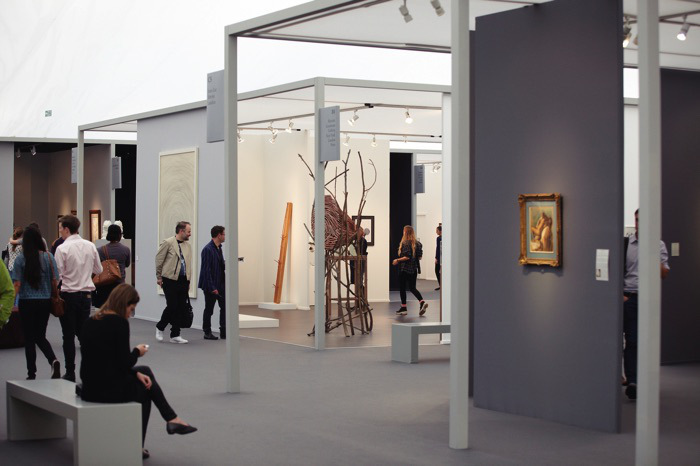 This year there is a new section at Frieze Masters, Collections, curated by Sir Norman Rosenthal. It represents eight scholarly exhibitions, each representing the collection and interests of an individual dealer, an expert in their field. The displays range from wooden Egyptian sculpture presented by Sycomore Ancient Art, Geneva to Italian majolica from Bazaart in London, and from Roman colored marbles in the collection of Galerie Chenel, Paris to expressionist portraits chosen by London dealer Simon Theobold. Rosenthal's aim is to show that it is still possible, 'with knowledge and love', to put together outstanding collections of art from earlier historical periods. Older PostRembrandt Discovered in New Jersey?